“Why would we want to start doing research?” I whined, concerned about the sudden clutter of brochures and guidebooks that could identify a museum or Roman ruin we might otherwise avoid. “Because we might miss things,” Carol accurately pointed out. “But we've already missed things,” I also believed I was accurately pointing out. “What things?” Carol's mild alarm was genuine. The look on Carol's face was the same as when I showed her the iron gate that guarded the entrance to our B&B in Naples, so I cut myself off. Thus we began a new direction to our trek through Italy, one I've come to define as “informed travel.” Under this new approach, Carol began to reveal the wonders of Italy that for me on my own would have remained unrevealed. This included the promenade in Reggio Calabria on a Sunday that, for regular Italians, is THE day of the week for the country’s famous passeggiare, or family stroll. 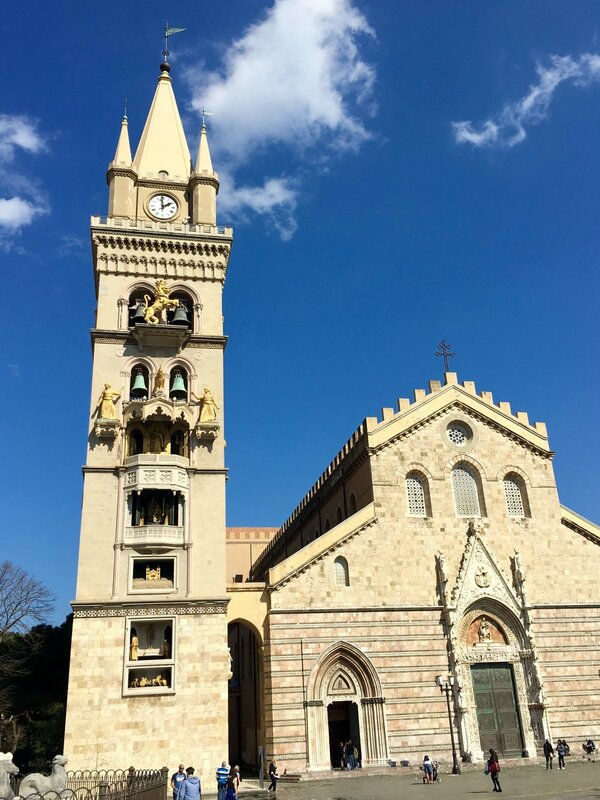 We also saw the Sicilian version of a Glockenspiel tower in Messina that I most assuredly would have missed, since I didn't know it existed (and would have missed it even if I'd walked right past it). You could also throw in the wonderful butcher shop/steak joint in Villa San Giovanni and the picturesque marina in Scilla. Most importantly we would have missed the little tidbit of information that the ferries along the Amalfi Coast were running again on March 25th, the very day we arrived there, after our B&B host had assured us they wouldn't start up until April. This enrichment of the travel experience was coming at great cost to my heretofore twin pillars of travel, namely idleness and dissipation. Now, instead of my normal blank stare when asked what I'd seen over my, say, solo six weeks in Europe, I'm now compelled to name names and identify actual places located on tour maps. But it does explain why Carol wound up with some 2000 pictures of interesting sights and scenery, instead of the handful of out-of-focus photos of pizzas, blind alleys and train locomotives I'd been coming home with.